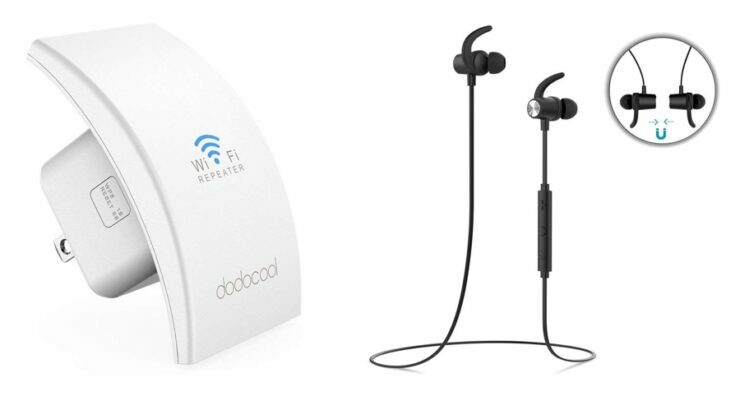 Dodocool has shared a couple of deals with us that include a pair of Bluetooth headphones for just $19.99 and a N300 WiFi range extender for $8.99. Dodocool shares a bunch of deals with us on an occasional basis, but whenever they do, it’s an all-out sort of thing with at least a 50% discount on some premium products. Today is no different, and they’ve discounted two products for everyone to grab, and it includes a paid of Bluetooth headphones and a WiFi range extender. The first deal is on a pair of Bluetooth headphones that originally retail for a price of $28.99, but they are now down to just $10.99 with a special discount code (below). Both earbuds connect together magnetically so you don’t have to worry about clutter. They also feature aptX support for high-quality audio over wireless. There are a lot more features under the hood and you can check them out by heading over to the link below. The second product on discount is a WiFi range extender which is an ideal product to have if your router signals struggle to reach a certain corner of your home. Since this features N300 speeds, therefore you can expect reasonable speeds throughout, provided you’ve placed this accessory in the right corner of your home. Originally priced at $14.99, this is now down to just $8.99.